Titanium and its alloys have been widely used as biomedical implant materials due to their low density, good mechanical properties, superior corrosion resistance and biocompatibility when compared with other metallic biomaterials such as Co–Cr alloys and stainless steels. Recently, β-type titanium alloys have been increasingly considered as excellent implant materials because of the remarkable combination of high strength-to-weight ratio, good fatigue resistance, relatively low Young's modulus, good biocompatibility and high corrosion resistance. Compared to the conventional (α+β)-type titanium biomaterials such as Ti-6Al- 4V, β-type titanium alloys containing non-toxic constituents possess Young’s modulus (~60 GPa) closer to that of bone (10-30 GPa). From the viewpoint of practical biomedical application, it is highly desirable to obtain β-type titanium alloys. Although biomedical titanium and its alloys have been widely used, extensive endeavors have also been made in the development of new β-type titanium alloys. In addition, surface modification of titanium alloys for biomedical applications, and manufacturing of titanium alloys by new technologies (such as by two common metal additive manufacturing technologies, i.e. selective laser melting and electron beam melting), etc. are also being done. This book covers the very recent progresses in new alloy development, surface modification and additive manufacturing of biomedical titanium. This book covers the recent progress of biomedical titanium alloys in terms of the processing, microstructure, mechanical properties and corrosion properties. 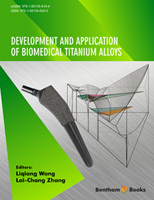 Chapter 1 overviews the application of biomedical titanium alloys and recent development process of new medical grade titanium alloys in terms of composition design, biocompatibility and shape memory effect etc. Chapter 2 describes the microstructure and mechanical properties of TiNbTaZr titanium alloy. The results show that the TiNbTaZr β titanium alloy with lower elastic modulus and non-toxic alloying elements has much more important application in biomedical field. The Ti-35Nb-2Ta-3Zr β titanium alloy is studied and the alloy has the complex properties of lower elastic modulus, high strength, high elongation and excellent shape memory effect. Compared with direct rolling, cross rolling is beneficial to the isotropic of the microstructure and mechanical properties. Chapter 3 presents the microstructure and mechanical properties of a serial of novel β-type Ti-Fe-based alloys developed very recently by using the DV-Xα molecular orbital method. The influence of Ta, Fe and Nb contents on the phase transformation, β phase stability and microstructural evolution of the alloys are investigated. The resulting mechanical properties of the alloys are evaluated and compared with those of the widely used biomaterials to ascertain their suitability for orthopaedic application. The results suggest that among the designed alloys, Ti-10Fe-10Ta, Ti-7Fe-11Nb and Ti-11Nb-9Fe presents the best combination of mechanical properties making them more desirable than the commonly used CP-Ti and Ti-6Al-4V materials for implant application. It is demonstrated that through proper alloy design it is possible to design new Ti alloys with favourable properties better than CP-Ti and Ti-6Al- 4V alloys for orthopaedic application. Chapter 4 illustrates the progress in processing, microstructure and properties of biomedical titanium alloys manufactured by selective laser melting (SLM). Although titanium alloys have exhibited combination of a serial of excellent properties, the hard machinery and/or high cost of materials removal arising from the conventional manufacturing processes hinder various potential applications of titanium alloys. Emerging additive manufacturing techniques, such as SLM, are providing the ideal platform for creating titanium components especially with complex dimensions. This chapter reviews the recent progress of the SLM-produced titanium alloys and composites as well as porous structures in terms of processing, microstructure and properties. Chapter 5 shows the microstructure and mechanical behavior of porous titanium alloys manufactured by electron beam melting of (EBM). This chapter discusses the influence of porosity variation on the mechanical properties of the β-type Ti-24Nb-4Zr-8Sn alloy porous samples, in terms of Young’s modulus, super-elastic property, strength and fatigue properties. The relationship between the misorientation angle between adjacent grains and the fatigue crack deflection behaviors are also discussed. Compared with Ti-6Al-4V samples having the same porosity level, the EBM-produced β-type Ti-24Nb-4Zr-8Sn porous components exhibit a higher normalized fatigue strength owing to super-elastic property, greater plastic zone ahead of the fatigue crack tip and the crack deflection behavior. The EBM-produced Ti-24Nb- 4Zr-8Sn components exhibit more than twice the strength-to-modulus ratio of porous Ti-6Al- 4V counterparts. Chapter 6 describes the preparation, microstructure and mechanical properties of NiTi-Nb porous titanium alloy. The results show that there are 4 diffusion layers, including Nb foil, NiTi-Nb eutectic region, pre-eutectic NiTi region and NiTi matrix at the junction of NiTi wire and Nb foil. In addition, a martensite phase was found inside the NiTi matrix. In the NiTi-Nb eutectic diffusion layer, niobium is inhomogeneously distributed, forming a rod-like Nb-rich phase, facetted Ti-rich phase and stripe-like or equiaxed NiTi-Nb eutectic structure. The experimental study on the microstructure and mechanical properties of interface between NiTi and Nb will help to understand the advantages of using Nb as the NiTi alloy connection material, provide theoretical support for preparation of NiTi lattice materials, and promote NiTi alloy more extensive application. Chapter 7 presents the surface modification of biomedical Ti-6Al-4V alloy by friction stir processing (FSP). Aiming at solving the problem of poor surface wear properties and improving biocompatibility of Ti-6Al-4V alloy, FSP is applied to fill with TiO2 powder in the groove to realize surface modification and build nano-sized composite biomedical material. Change in microstructure and its relationship with mechanical performance such as hardness will be discussed. A series of experiments in biology, including cytotoxicity test, cell culture, adhesion, proliferation and alkaline phosphatase activity is carried out to verify bio-compatibility of the material, compared with original Ti-6Al-4V. The improved material is expected to provide a better environment for cells to grow. Chapter 8 shows the very recent progress in the corrosion behaviour of titanium alloys manufactured by selective laser melting (SLM). The different manufacturing technology of titanium alloys has a substantial impact on its performance, like that the mechanical properties of Ti-6Al-4V manufactured by selective laser melting (SLM), exhibiting comparable and even better mechanical properties than the counterpart produced by traditional manufacturing methods. Yet, the understanding of the corrosion behavior of SLM-produced materials is unknown. This chapter reviews the recent progress of the corrosion behavior of SLM-produced Ti-6Al-4V and Ti-TiB composite. The corrosion characteristics and mechanisms are discussed in detail. Finally, we wish to thank all the authors for their contributions to this book.